Launcher 10 is a launcher for Android that will make the home screen on your phone look like a Windows Phone device. The app offers a number of customizations and is perfect for those who love the look of Windows Phone, but prefer Android overall. Yes, Launcher 10 includes Live Tiles, and Tile Badges will show you the number of unread notifications for each app. You can pin apps as tiles to your home screen, add widgets and create folders with multiple apps. Many bug fixes, reliability and performance improvements. Notification live tiles will now show a background image (if the notification has an image). You can now choose the size of the icon for each tile (either normal, fill, fit or crop). New “Rotate Screen & Scale Tiles to Fit” option. New Start Screen margin preference to add space to the sides of you start screens. Live tile calendar events will only be shown if you have that calendar enabled/visible in your calendar app. You can install the app on your Android handset by clicking on the sourcelink below. I dont no why, but this WM10 style makes borderless displays even more borderless than they are. 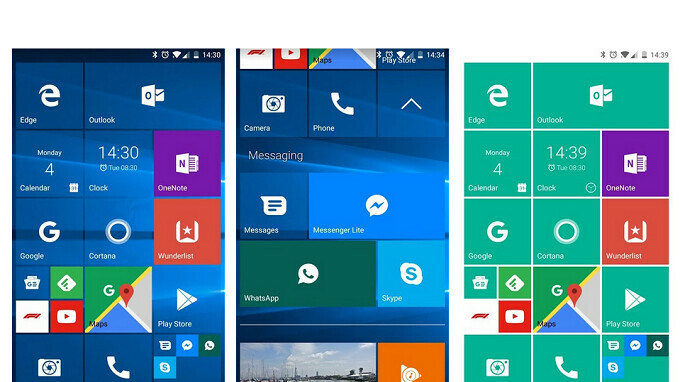 I really like the look of Windows Phone, especially WP 7 and WP 8, simple and elegant, after 8.1 and 10? It basically driven by bugs, TONS OF BUGS, and few apps. That because they're trying to be unique as possible. Time after time, they are realizing that they can't do it anymore and abandoned the OS. Lol apple must of gave up years ago and WP is still the most unique OS.